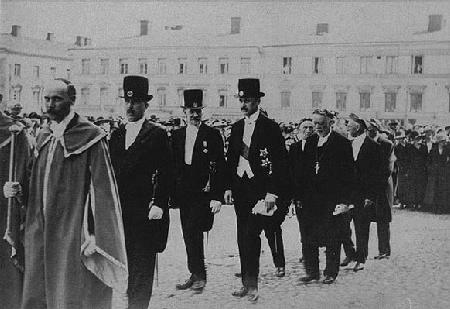 In the ceremonious promotion of the Helsinki University in spring 1919, Gustav Mannerheim, Regent at the time, became and Honorary Doctor of Philosophy. Mannerheims daughter Sophie was chosen the binder of the bays in the promotion, and the celebration took place in the official residence of the Regent, in Etelä-Esplanadi, Helsinki. Mannerheim appreciated the activities of the universities and attended many festive occasions. After the end of the Winter War, he accepted the honorary membership of Varsinaissuomalainen Osakunta, which was the fraternity of his home region in the university.